Combine all ingredients, excluding steak, in a bowl and whisk. Place steak in a glass dish or sealable plastic bag and pour marinade on top. Marinate in refrigerator for at least 1 hour or up to 4 hours. Spray non-stick cooking spray on grill and heat to medium-high. 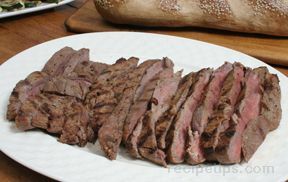 Remove steak from marinade and place on grill, discard marinade. 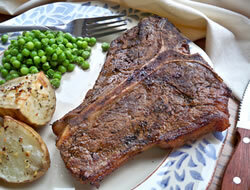 Grill steak until medium-rare, about 4 to 5 minutes per side. Remove from grill and let sit for 10 minutes. Cut across the grain into 1/4-inch slices.